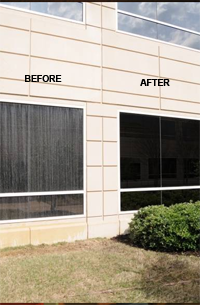 Over the service life of exterior architectural aluminum, the effects of the local atmosphere will take its toll on exposed surfaces. In large urban environments, corrosive pollutants will eat away at unmaintained anodized aluminum and cause blooms of aluminum oxides and pitting. In seaside environments, salt spray and the abrasive effects of wind blown sand will degrade even the most durable of high performance paints on aluminum. Determine, through observations and testing, the cause and extent of deterioration present on the façade. 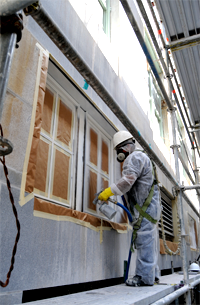 Formulate efficient method of restoration, based on AAMA (American Architectural Manufacturers Association) guidelines for the cleaning and maintenance of architectural aluminum. Perform mock-up of method for quality control purposes. Mobilize equipment and personnel , and carry out job to completion. We at ADDCO METAL have extensive knowledge of the properties of metal, and we have the history of restoring those metals to like-new condition. Call us for an estimate.